Though his Noah will hit theaters in just over two months from now, Darren Aronofsky has been forced to make a late addition to his biblical epic. God spoketh to bring upon the ark "every living thing of all flesh," and because Nick Nolte remains a living thing made of what's probably still considered flesh, he too is being brought aboard. Aronofsky today tweeted that Nolte will play Samyaza, described by Wikipedia as "leader of a band of angels called the Watchers that are consumed with lust for mortal women." 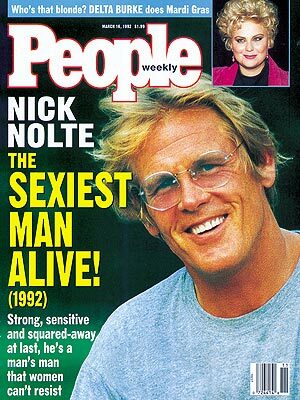 Much as the group called People was once consumed with lust for mortal Nick Nolte. The director didn't give any specifics about how the role plays into his story, but his tweet was accompanied by the above image, suggesting it's merely a voice role being recorded on a soundstage. Nevertheless, Nolte, being the dedicated method actor he is, appears to have somehow still gotten himself drenched. \n\nThough his Noah will hit theaters in just over two months from now, Darren Aronofsky has been forced to make a late addition to his biblical epic. God spoketh to bring upon the ark \"every living thing of all flesh,\" and because Nick Nolte remains a living thing made of what's probably still considered flesh, he too is being brought aboard. Aronofsky today tweeted that Nolte will play Samyaza, described by Wikipedia as \"leader of a band of angels called the Watchers that are consumed with lust for mortal women.\" Much as the group called People was once consumed with lust for mortal Nick Nolte.\n\nThe director didn't give any specifics about how the role plays into his story, but his tweet was accompanied by the above image, suggesting it's merely a voice role being recorded on a soundstage. Nevertheless, Nolte, being the dedicated method actor he is, appears to have somehow still gotten himself drenched.